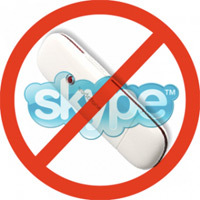 Two days ago, citizens in Egypt using USB Modem to connect to the internet weren’t able to use Skype , a free software program that allows you to make voice calls over the internet (VoIP). At the beginning they thought there is a kind of internet connection issue, and when they started calling the mobile telecommunication companies they were informed that Skype is no more allowed to be used through USB Modem. Today, I called the customer service section at Vodafone  company, and I was informed there is a decision issued two days ago by the National Telecommunication Regulatory Authority  to block Skype from being used via USB Modem, based on complaints by the three mobile telecommunication companies in Egypt, for facing financial loss because citizens are making phone calls online with low price. “The ban is on Skype on mobile internet, not on fixed, and this is due to the fact it is against the law since it bypasses the legal gateway,” said Amr Badawy, the executive president of the NTRA to Reuters  on Tuesday 16 March. National Telecommunication Regulatory Authority: http://www.tra.gov.eg/english/main.asp?